The second generation of the authors writing in Hindi has seen many changes in the writing style as well the expression. And reading him, you will notice that Ashish is not an exception to that. He also deals with the vivid theme of life in his short stories and many of them were not touched by the authors a generation before. Because the life has changed dramatically over generations, the authors had no choice but to change according to it to accommodate themselves in the modern day lifestyle to create something which could interest the readers even today. Still, Ashish Dalal’s writings have never been in that category which only offers entertainment and nothing else. Uske Hisse Ka Pyar, his debut book, is a perfect example of that. In this collection, readers will have the chance to read the short stories which exhibit the various aspects of human life and its dependency on love and other relationships but with a certain degree of decorum and height which offers more than mere entertainment! 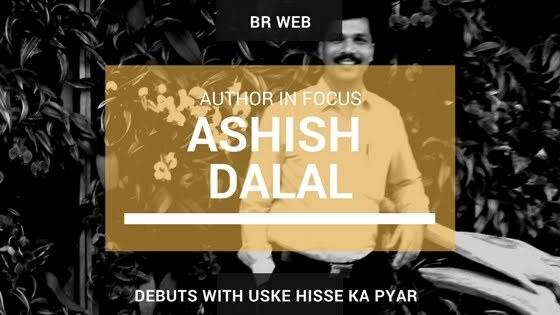 Ashish Dalal touches the issues of marriage, love, physical intimacy, caste-creed, love-marriage, limits of the relationships and much more. His dealing of these issues is apt and wonderfully executed which offer the readers the best possible short stories which could be produced by any author. He has included only seventeen stories in his debut book and all of them will certainly make the readers think once they end. To personally form your opinion about the writings of Ashish, you need to read his book. Uske Hisse Ka Pyar will be available for purchase on Amazon after 15th November 2017. You can order the book and get your copy secured before it is launched formally. And we are sure that you will an altogether new dimension of Hindi literature to be explored once you start reading his book. Happy reading! All the best!